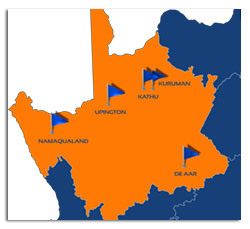 De Aar is located in the middle of South Africa and serves the De Aar, Britstown, Victoria West, Prieska, Petrusville, Colesberg and Hanover Area. Students at De Aar Campus are encouraged to maintain a balanced lifestyle. Participants in various activities can help to achieve this. Culture: Events at De Aar Campus provides opportunities in various fields of talent competitions. Our aim is to provide you with the best preparation to excel in life. We have some of the best lecturers in the country and our courses are aimed at the local environment. De Aar Campus has a student support devision that takes care of our students. When a student is not performing to his maximum or stay out of class the student support is notified and they follow up on our students. They also provide counseling, job opportunities and bursary services for students. De Aar Campus is recognised by the SA Government as one of the most reliable and trusted institutions offering courses that are relevant to the needs of South Africa. De Aar Campus will assist you to overcome a variety of difficulties and will make you see your true potential as a person and enjoy life! The Campus is located in Town and our beautiful building is iconic to De Aar. We take great pride in keeping the building in tip top condition. De Aar Campus has a fully functional training centre for Building and Construction and Business Studies.